With an explosion in the number of concealed-carry permit holders in the United States, potential gun owners are faced with a multitude of choices for a concealed carry firearm. Considering carrying, shooting, and comfort, most people hesitate to wear powerful handguns, so they lean toward smaller, more easily handled semi-automatics and revolvers. In this article, we're going to breakdown some of the best Glock 36 holsters currently on the market. With this, we'll be taking an in-depth look as to why each model make our list and what makes them stand out. Let's get started! What Makes the Glock 36 a Great Concealed Carry? When it comes to the best concealed carry gun for self-defense, Glock has been one of the world's leaders in weapon engineering with their top-notch compact models for many years. 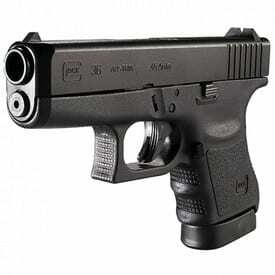 The sub-compact Glock 36 in .45ACP is a big-bore, purpose-built concealed carry handgun. The Glock catalogs G36 as unique “Sub-compact Slimline” model in this series, since the Glock 36, unlike other counterparts, features a Slimline profile with its single-stack six-round magazine and narrower secure-grip design, which reduces the width to only 1.13 inches. In regards to potent, popular chambering, an obvious bonus is that you do not compromise stopping power for increased concealability. On the flip side, the smaller grip size and more easily concealed profile mean that you get four fewer cartridges than it fatter brother, the G30, but this is easily negated by carrying a second magazine, included in a Glock 36 package. With field-tested technology, the Glock 36 proves to be an ideal defensive pistol, mainly as a backup weapon. The possibility to have a primary and secondary handgun in the same caliber is quite satisfying, but if you further pair guns of the same design and system, the combination is far more advantageous. That’s why the Glock 36, a compact .45ACP, perfectly complements the full-size Glock 21 sidearm. Although the skinny Glock 36 offers the punch of a big-bore revolver, it handles the recoil reasonably. Moreover, it's an excellent alternative to larger framed sidearms if you want to carry a .45 under light clothing in sweltering weather. 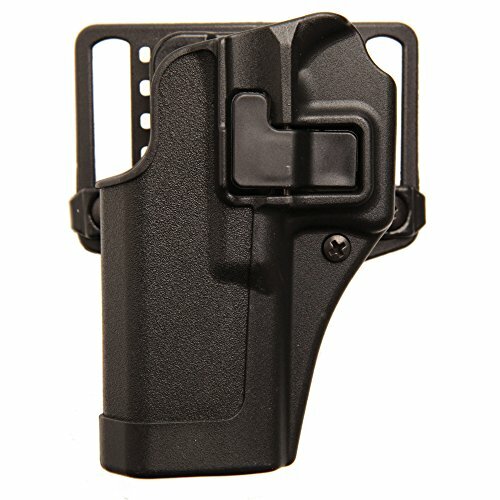 What is the Best Type of Holster for the Glock 36? The most natural carrying choice for the Glock 36, as a compact personal carry gun is an inside-the-waistband carry, tuckable holster. This little Glock literally disappears under an untucked T-shirt when it is carried in a proper inside-the-waistband holster. Unlike inexpensive, soft fabric IWB holsters, a quality made holster will provide daily carry comfort with the curved shell of the holster securing the weapon in place and, at the same time, hiding the outline of Glock and protecting your body from being rubbed by the gun. As the thinnest pistol in Glock‘s catalog, the Glock G36 comes without sharp edges or rough spots, whereas the muzzle end of the slide is tapered to help in quick and sure one-hand re-holstering. The size of this .45ACP pocket rocket makes the Glock 36 ideal to be carried inside-the-waistband, but the G-36 still has a barrel that’s almost four inches long. Therefore, this class of defensive handguns is also great to be carried in outside-the-waistband holsters but will work well in an ankle holster. While some people wear the G-36 in a shoulder rig or pocket holster, it can be harder to conceal, slower to access, and it is not as comfortable as waistbelt holsters. There are a number of fine carrying rigs available for the Glock 36, but the choice depends on your personal preference. Anyway, the major features that most CCL holders are looking for in a holster for their G-36 include firearm concealment, ease of draw, and gun retention. Since the Glock 36 holsters come in all shapes, sizes, methods of carrying, and materials, we have prepared a substantial collection of carrying systems that attract attention for comfort and practical all-day carry with defensive sub-compact pistols like the G36. So far we have seen some the qualities desired in a holster. Now, we will look into the details of few of the best holsters for Glock 36 on market. BlackHawk is one of the most recognizable names in holsters, and their patented Serpa Technology is now available also for the Glock 36 model. The Serpa CQC Concealment Holster keeps your Glock in place with a combination of adjustable passive retention options and SERPA's signature Auto-Lock. Featuring the patented SERPA Auto Lock Release, it delivers a smooth draw, easy re-holstering, and unparalleled weapon security. In other words, the SERPA CQC Concealment Holster allows a full firing grip during draw using a normal drawing motion, with the trigger finger alongside the holster body. The holster’s speed-cut design also provides immediate retention upon reholstering with an audible click. This Serpa holster comes with both belt loop and paddle platforms, offering you plenty of adaptability and versatility. A screwdriver is the only tool needed for the Serpa system since both cant angles are adjustable via a three screw pattern that can easily be unscrewed from the paddle holster and installed in another Serpa mount holster. Unlike the lighter polymer-made Sportster holster, the carbon fiber body on the Serpa CQC Concealment holster is more robust and more rigid. Although Blackhawk recommends the CQC for military and law enforcement personnel, this Level II holster is perfect for civilian and range use, bearing in mind all of your concealed carry needs. For the Glock 36, already a small and easily concealable handgun, the CQC holster gives the possibility to be worn with comfortable clothing all year round, while keeping it safely hooked to your body. This OWB (outside-the-waistband) holster, also known as an open carry holster, is an extremely comfortable way to carry a defensive weapon such as Glock 36 concealed, particularly in a small gun sheath or pancake style. R&R Holsters offers their outside-the-waistband gun sheath designed specifically for concealment carry for smaller firearms when worn with a loose fitting shirt. The R&R Outside the Waistband pancake holster is made out of a lightweight Kydex material that is less than a tenth-of-an-inch thick (actually it is .08" thick). Robust build quality makes this Kydex OWB holster tough, sturdy, and able to withstand harsh conditions. 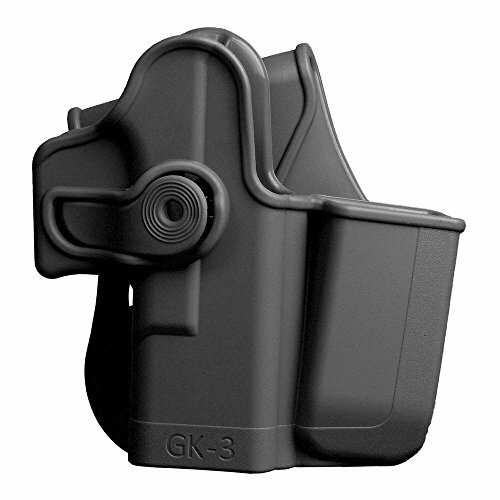 The Kydex material is molded to the shape of your Glock 36, so this holster conceals more of the surface area of the gun for the best and most secure fit. While it is a bit unreasonable for an OWB holster to come without retention devices, the R&R holster also comes without annoying retention straps but the friction fit around your Glock is plenty to hold it in place during your usual daily activities. The holster incorporates two belt loops that attach securely to your belt, offering an adjustable cant and an additional 1/2" of adjustable ride height. There is only one negative about the holes as they may not align appropriately as you would expect them to. This OWB holster is designed to hug your body and its contoured backing with a partial sweat guard will keep sweat away from damaging your Glock. Hip holsters can be the most comfortable method if you carefully choose the size of the holster. This OWB rig is an open-ended holster with a low-profile to avoid noticeable printing but is still big enough to hold your weapon securely and distribute the weight evenly. It is a perfect design for first-time buyers and people who want to experiment with outside-the-waistband carry. The Outlaw holsters NT Hybrid means that it is constructed of both leather and Kydex because they have the best durability properties. This favorite inside-the-waistband holster (IWB) features 9 oz. drum-dyed and sealed leather backing that is smooth and comfortable against your body, while the front panel 0.080" thick Kydex provides a firm, resistant surface to protect and lock your Glock 36 in place. Additionally, the leather back panel is water-resistant and acts as a sweat guard. The Outlaw Holsters hybrid design gun carrier is available for more than 150 different handguns and is designed to deliver the most optimal fit for each gun. The most comfortable carrying positions to wear this rig are side or rear carry positions. While this NT (Non-Tuckable) hybrid gun sheath is not intended to be worn outside-the-waistband, its belt clip prevents you from tucking in any shirt you want without significant printing. The Outlaw Holsters NT Hybrid holster is form-fitted to the particular gun, but for this type of Glock, you should wear a long clothing layer to cover the holster for a more discrete look. 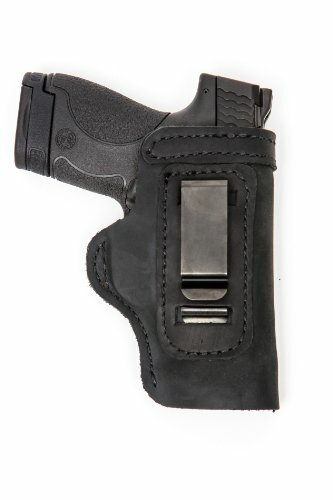 By utilizing the leather and Kydex, two of the best materials used for gun holsters, the manufacturer provides this product with a one-year replacement warranty. IMI Defense is a proven manufacturer of accessories for weapons, and their Retention Roto Holster with Integrated Magazine Pouch has accumulated the immense experience of military "know-how" in the battle-proven design. The IMI Defence Roto Retention holster comes with the paddle holster attachment, but optionally, you can order five other mounting platforms such as belt loop, clip attachment, drop leg holsters, low-ride, or Molle compatible attachment. The supplied paddle platform in the form of a fin ensures stability and provides convenient carrying and quick draw. However, the only serious criticism from some users of this holster refers to only one fixing screw that can easily break from the paddle platform. The holster and platform are built of a very stable polymer material that provides positive retention for both gun and spare magazine. Additionally, this right-handed holster has a protective sight channel. The re-holstering is very simple and intuitive, followed by the authoritative click that lets you know your Glock 36 is locked positively in place. The IMI Defense Roto holster is crafted from a durable black polymer, and as a smart alternative to the BlackHawk SERPA, it comes with a safety latch that employs a much larger release button for more natural drawing, especially in stressful situations. The position of the large, round retention release is very natural and intuitively at the place where your index finger usually slides down at the ready. The polymer IMI holster for your G36 comes with an integrated magazine pouch, which is an awesome feature due to the limited six-round magazine capacity of your subcompact single-stack Glock. The Roto system is another selling point of this holster since this feature makes it easy to adjust the angle of the holster very precisely. Whereas the holster rotates 360 degrees, it will allow the pistol to be positioned at a selected angle, enabling use for every application (small of the back, cross draw). As a minor design flaw, the carrying angle cannot be effectively shifted forward because of the spare mag carrier. Initially, the IMI holster was intended for military and defense community, but this stable and functional holster soon found its place on the waistbands of civilians and off-duty officers. With many carrying options to choose from and a reasonable price tag, you get high flexibility combined with a comfortable, contoured fit. The simple, lightweight, and minimalist Pro Carry LT is designed as an inside-the-waistband concealed carry rig. The Pro Carry LT IWB holster comes with a steel metal belt clip with hidden retention prongs intended to aid in securing your IWB sheath with two distinct anchor points. 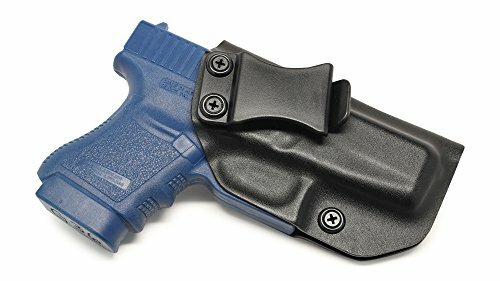 Besides, this gun-blued metal clip makes it extremely easy to put on and take off the LT holster making it a viable EDC option. Unlike some other leather holsters made of horsehide, the Pro Carry LT Leather IWB holster is built using full-grain American cowhide. While this classic material is incredibly comfortable against your skin, the holster has a smooth leather lining to provide for a fast and easy draw. As a bonus, the great leather style piece also tends to be more comfortable in hot, humid areas than others made of synthetic materials. Besides the many advantages this classic material really has, it requires some specialized leather care, as well re-holstering can be tricky. Although the Pro Carry holster's top (opening) has double leather layers, there is only a tiny bit of reinforcement and it collapses, so it's hard to put the weapon back in. As a first IWB design from Pro Carry, the LT is an entry-level CCW leather holster explicitly sewn for the exact handgun, providing a snug fit and perfect weapon retention. 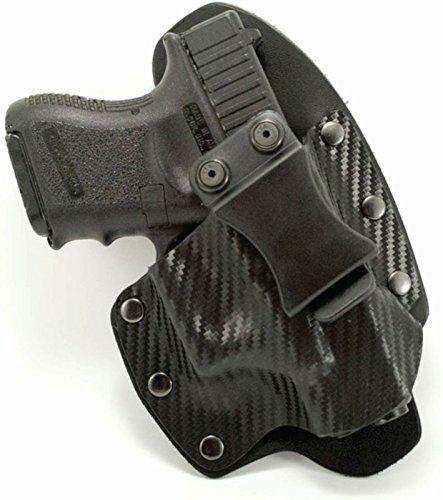 The Pro Carry LT can be worn on your strong side or opting for opposite side holster, can be carried as a cross-draw. Besides the option of a left or right-hand draw, the holster is available in black, mahogany, or just natural leather. Since this minimalist holster does not have a high backing between you and your Glock, prolonged sitting while wearing this holster is mildly uncomfortable. Being made from leather, the Pro Carry LT IWB holster scores high for comfort and daily use. The holster is adjustable enough to enable a carrying angle that will make your Glock as concealable as possible. For a long time now, in the television series, Miami Vice, Don Johnson has worn Galco's Miami Classic shoulder rig. 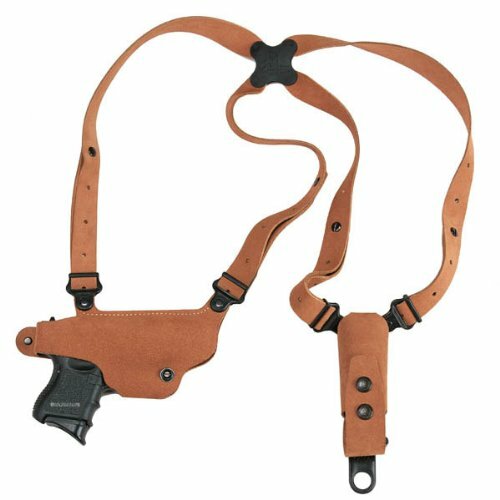 As a company that has perfected the shoulder holster, Galco Gunleather offers a lightweight variant called the Classic Lite Shoulder Holster System. The Galco Shoulder Holster’s impressive construction consists of a medium-width harness matched with the same clover shaped Flexalon swivel backplate as their professional rigs use. All included leather parts of this lite system, including holster, harness, and ammo carrier are made of premium center-cut steerhide that should almost last a lifetime with proper care and use. This underarm rig positions your Glock 36 securely in a horizontal orientation with a retention strap, whereas the opposite side of the holster features a single magazine pouch. Carrying a spare mag with you is a convenient feature due to the limited magazine capacity of your single stack G36. Though purpose-built for compact guns such as our Glock 36, the Classic Lite Shoulder holster provides a balanced load that is comfortable to wear, even after long hours of use. The Classic Lite is indeed light and small, yet uses the same-patented connectors, hardware, and necessary X model straps in the rear to provide the same great fit and comfort and allow for easy adjustment. The Classic Lite holster with soft external leather material doesn't grind against the body, making it a perfect choice for everyday carry and raising a comfort to an entirely new level. The Classic Lite System is a very reasonably priced, alternative shoulder system designed for part-time carry and concealed carry when the situation dictates. Compared to the OWB holsters inside-the-waistband holsters (IWB) hide better since those rigs are designed to slide inside your pants and press against your body for deeper concealment and added security. 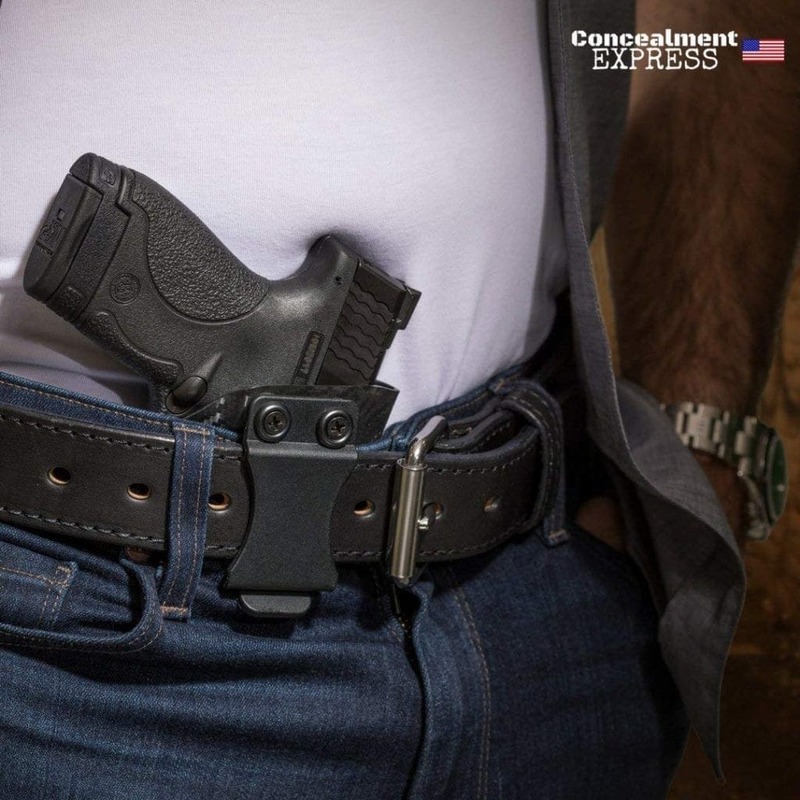 Without a doubt, Concealment Express encompasses the most extensive variety of Kydex holsters and their IWB model is optimized to be worn inside-the-waistband with a belt and an untucked shirt. The company made this IWB sheath from very light (only 2.5 oz.) 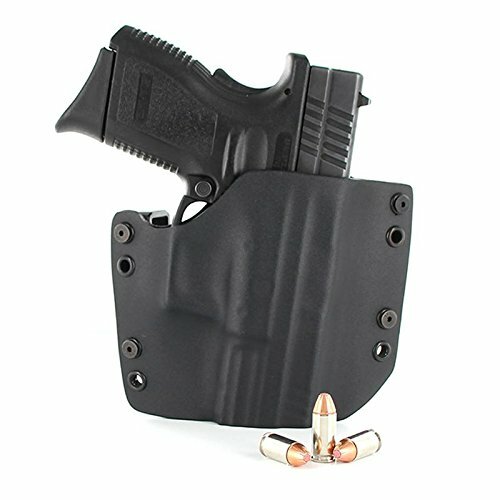 .08" thick Kydex material which provides a perfect molded fit for the 36‘s slim profile, but this type of holster can also carry other similar size semi-autos. The rigid structure and an integrated sweat guard design also help with re-holstering the weapon with ease. The holster features a retention lock system with a loud click sound to let you know that the weapon is properly holstered. The holster has adjustable retention pressure to achieve the right level of friction for your Glock. One particularly useful feature that makes Concealment Express Compact Holster an excellent concealment rig is an adjustable cant (or angle). It ranges from upward draw to the slightly tilted forward cant (called an FBI cant) and enables several positions for carrying, making it quite versatile. On the flip side, this light and the straightforward holster doesn’t have any kind of soft inner lining, so your sheath may easily scratch the finish of your Glock 36. Aside from this minor design flaw, some users have complained about the weakness of the plastic belt clip. The simplistic design of this holster is easy to hide and doesn’t print, no matter what clothes you’re wearing through the day. In addition to all mentioned features, the holster comes with a lifetime warranty and a very reasonable price so it could be a good option for first-time carriers of Glock’s small single-stack. While sometimes fashion dictates carry styles, there are specific situations when an Ankle holster offers a comfortable and concealable carry option and represents the only way to go. The Concealed Carrier ankle holster excels for its comfort, as it utilizes a magic holster material called neoprene. Concealed Carrier, LLC made their leg holsters of a soft but durable elastic neoprene wrap combined with a Velcro closure. This leg rig features thick foam innards inside the holster, so you don't feel your pistol digging into your leg. The neoprene material includes air holes that allow ventilation and provides resistance to sweat buildup. The universal elastic holster attaches in two places with a simple Velcro closure. The design utilizes the added strap over the shin to keep the leg holster in place during movement. Unlike some holsters with noisy Velcro retention, this ankle holster safety includes the retention strap with the thumb break to quietly and effectively draw the firearm. Concealed Carrier also includes an extra built-in elastic pouch to hold a spare magazine, a folding knife, or other non-lethal pieces of gear you may need. 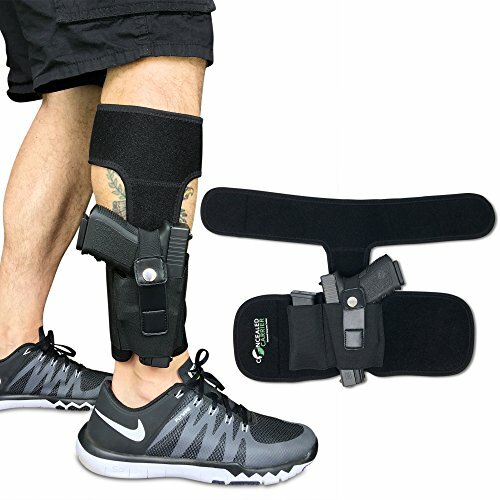 As a good ankle holster, the Concealed Carrier Leg Holster may be carried left or right-handed. The general recommendation is to wear it on the ankle of the shooting hand. Though one of the cheapest ankle holsters available on the market, the Concealed Carrier rig is feature-packed. This is a fairly universal leg holster in both ways. It means this gun carrier will fit any size calf and ankle, while the elastic part fits a variety of pistols and revolvers. However, common sense recommends that small-frame subcompacts such as Glock 36 are the practical limit in ankle carry for most people. The sub-compact size of the Glock 36 will make it work well with each of these very different carry platforms and methods, thanks to the 36's ultra- slim profile and minimal dimensions. Anyone who owns a G36 knows that a good holster is almost a pre-requisite that can make carrying your Glock 36 a breeze, no matter if you’re active outdoors or sitting most of the day. While holster choice is going to be based on personal preference, a single holster type is rarely the best carry solution for one of the most popular concealed carry .45 pistols, such as the Glock 36. Therefore, we have prepared the above list of holsters with the majority of them in a reasonable price range with different carrying styles.